Best review ever on this particular book is the one I read on GoodReads.com, the reviewer claimed that it was ‘unoriginal’ …. Yes, you read that right, UNORIGINAL! Could be me, I’m not sure what they expected but of course it’s unoriginal! It’s a freaking parody, in this case being original would be a bad thing! It kind of makes me wonder if this person doesn’t know what the word ‘parody’ means or if they just didn’t get the idea behind this book. Nonetheless it is a strange comment given that this book makes it very, very clear that it is a parody and I honestly can’t understand how you can read it any other way. Especially the part where there is a very clear and obvious reference to the author, Stephordy Mayo. Of course it doesn’t take away to the fact that there are some people who might not be familiar with the meaning of that particular word. On the other hand if you take the time to read a book and don’t know or aren’t sure about the meaning of a specific word I would think, expect even that you would be interested enough in figuring out what the word means. 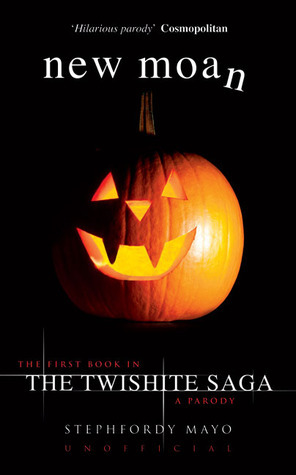 What I want to say though is that I had a lot of fun reading this book, in this case because it takes what I don’t like about Twilight and highlights those details and exaggerates them at precisely the right moment. This book made for a great read, especially since I read this ‘lighter’ material during the time that I was reading the ‘Tomorrow Series’. Which at times could be somewhat depressing, this book gave me the opportunity to read something different. Now I really want to read a ‘Hunger Games’ parody! I am huge fan of The Hunger Games fan and it might be somewhat comfronting, but I think that as long as you don’t take this too serious you’ll be fine. Maybe I can pick up a Hunger Games parody when the book fair is back in town in November. Don’t worry, until that time comes I have enough books to choose from.